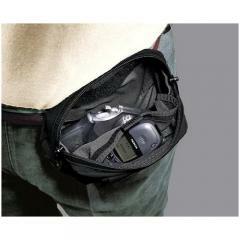 have many fanny packs & purses to choose from. Perfect for discreet off-duty carry, Gun Pak holsters are storage packs with a hidden gun compartments optimized for a quick smooth draw and one-handed return. Separate gun area features Zip and Hook & Loop closures. Fits belts up to 2 1/4" wide. Molded loops fit belts up to 2.25"
Great service, good product fast delivery. Will do business with this company again. Keep up the good work. Fits a small S&W Bodyguard nice and cellphone in other pocket.